Finding Heaven on "The Devil's Highway"
A National Scenic Byway, Route 191 winds it way high into the mountains above Clifton. It's one of the most scenic sections of the former Route 666 aka "The Devil's Highway", which slices through the Rocky Mountains from Mexico all the way to the Canadian border. When so many popular outdoor recreation areas in southern Arizona are burned up, washed out or overrun, it's amazing that so few people take the time to explore the Coronado Trail. Even on a mid-summer weekend, you're lucky to see one car an hour. Farther north of course, the Wallow Fire of 2011 scorched huge swathes of the forest, but from the mine to Hannagan Meadow, the jagged volcanic mountains are clothed in dense stands of Ponderosa pine, Mexican blue oak, pinon and alligator juniper that are untouched by any recent fires. With most of the Coronado Trail soaring between 6000 and 9000 feet in elevation, the hiking trails and campgrounds in this area are typically 15 to 20 degrees cooler than the valleys below, making it an ideal destination for outdoor recreation even in the depths of the summer. 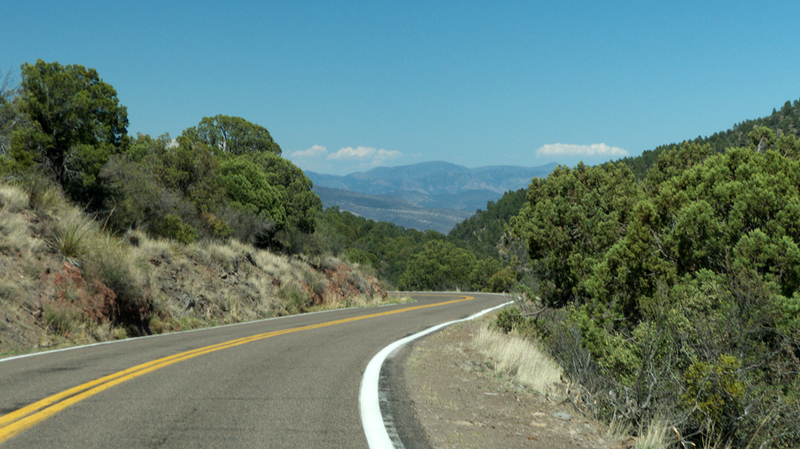 The Coronado Trail — US 191 from Clifton to Alpine, Arizona, is well-known to driving enthusiasts and always makes the "best driving road" lists in motoring magazines and blogs. Combining it with US 180, a parallel route just the other side of the New Mexican border, makes an outstanding two-day loop that is undoubtedly one of the best weekend road trips anywhere in the Southwest. Reports of strange encounters with mad truckers, packs of demon dogs, ghosts and other apparitions gave the route a bad reputation, so officials in most states along the route eventually changed the name to US 191. But even with the name change, the route from Clifton to Springerville, now dubbed "The Coronado Trail" — is a grand adventure spiked with an element of risk. If you're considering the drive, be aware that this is no Sunday afternoon promenade. The road climbs quickly into rugged mountain terrain, reaching its maximum elevation of 9,370 ft (2.743m) near Hannagan Meadow. It's common to encounter ice and snow along the route, in the winter as well as during the spring and fall shoulder seasons. And speaking of shoulders, don't expect any on the Coronado Trail. The route is paved, but it's narrow and tightly hairpinned, with many blind curves, so allow three hours to cover the 90 miles between Clifton and Alpine. Keep an eye out for wildlife — elk, osprey, black bears, bald eagles, antelope, mule deer, Mexican wolves and bighorn sheep are all common in Apache-Sitgreaves National Forest. Distances below are based on the nearest milepost, bearing in mind that US Route 191 begins at the Mexican border near Douglas, Arizona, and runs for over 1900 miles all the way to Loring, Montana, at the Canada-US border. Mile 177 – Past the mine the road enters the Apache-Sitgreaves National Forest and begins climbing quickly via a series of rather thrilling hairpin turns through tortured red rhyolite cliffs. There aren't many pull-offs here, so keep an eye on your rear view mirror for jaw-dropping views of the narrow road coiling beneath you, and beyond the yawning chasm of the Morenci mine and tiny Clifton tucked into a narrow canyon that opens onto the broad plain of the Gila River valley. On your left there is a small parking area at the trailhead for Painted Cliffs Trail #13. 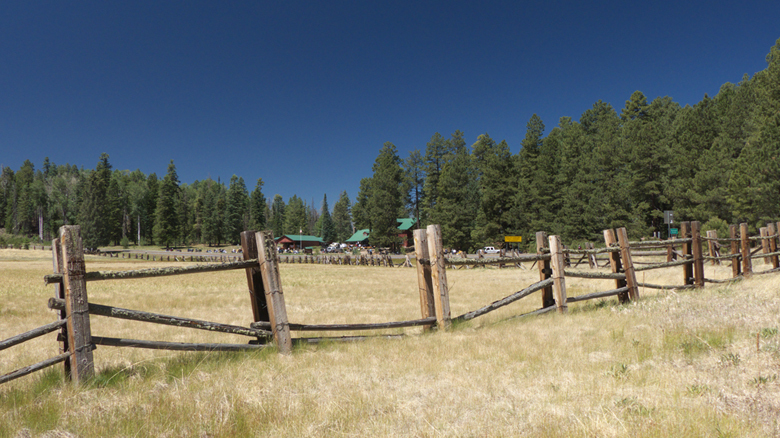 Mile 178 – Pass Cherry Lodge picnic area on your left and Granville Campground on your right. A rough loop road takes you well away from Route 191 to 11 well-shaded campsites in a lush forest of Arizona Cypress, Quaking aspen and Gambel oak trees. The sites are large, widely separated and built up to compensate for the steep terrain. Astonishingly, on a Saturday night in June there wasn't a single camper here. 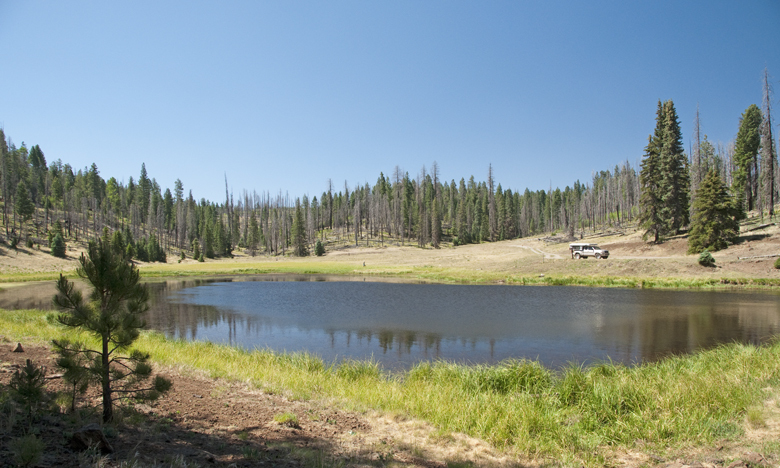 The campground is at 6600 feet in elevation so it offers a cool, shady respite from the heat of the valley. From the campground a trail climbs slightly higher on the canyon wall, paralleling the road, to reach Sardine Saddle in three miles. Sardine Saddle follows the route of the old road. Mile 179 – Parking area for Spur Cross Trail #8 on your left. Mile 181 – At 7000 feet, Sardine Saddle is the first of a series of spectacular vistas. 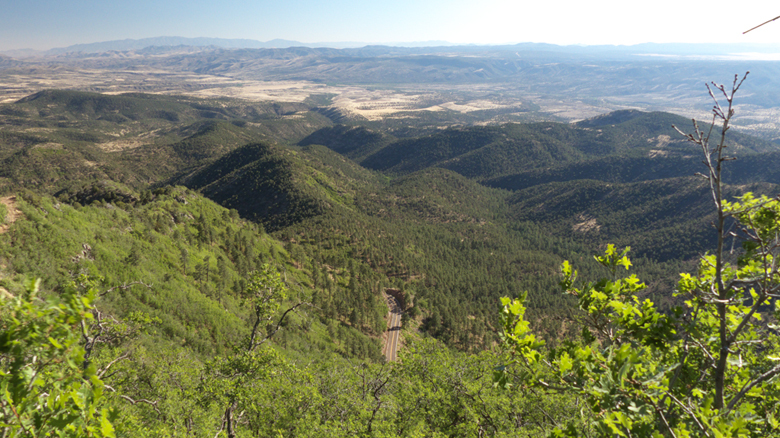 You're on the edge of the Mogollon Rim, Arizona's "second story", crossing the state diagonally and rising a solid 2000 feet above the southern Arizona desert floor. There are pit toilets on the left and a small picnic area on the right, but if you want a primo spot for lunch, continue up route 191 another mile to HL Saddle. 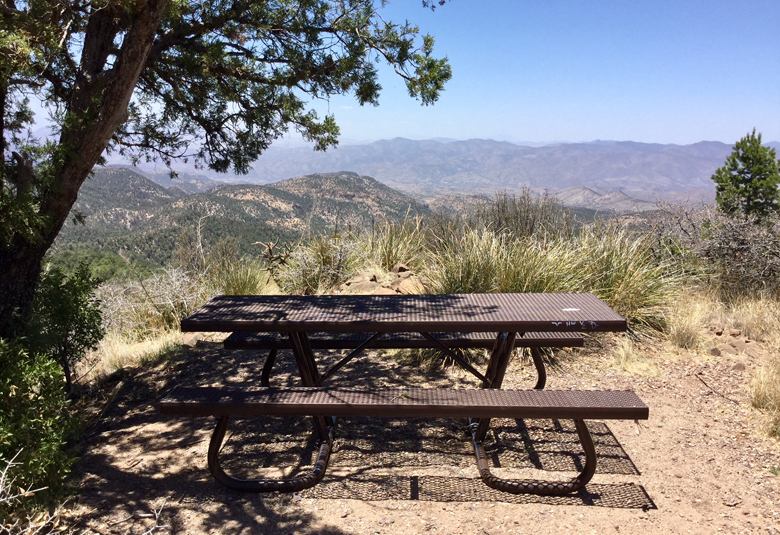 Mile 182 – HL Saddle at 7100 feet has pit toilets and several picnic tables, but take the time to follow a short trail along the nose of the ridge to the table perched on the edge of a cliff. Across Route 191 from the picnic area, HL Canyon Trail takes off to the east, starting off as an old forest road. Just past HL Saddle, look for Grey Peak, a prominent volcanic cone that rises to 7698 feet, on your left. Mile 182 – A pull-off on the right for a trail that drops into Pigeon Creek. Mile 185 – Near the ADOT maintenance station, the road makes a series of hairpin turns to descend about 1000 feet to a rumpled valley. Upper Eagle Creek Road takes off to the left, heading for sweeping grasslands and massive ranches that look more like Wyoming or Montana. A few miles out you'll pass by the pumping station that supplies water to Eagle Creek. Past this point mighty Eagle Creek is a mere trickle. At the end of the road is remote Honeymoon Campground. A stone's throw past Upper Eagle Creek Road is Juan Miller Road. From here it's 13 miles to the Blue River. 192 – Roll onto Four Bar Mesa, a vast yellow grass meadow shorn of trees by previous firez. This is Four Bar Mesa. A pinon and juniper forest is springing back to life in the hollows. 196 – Pine Flat Road FR 515, west side. 198 – Small camping area at the trailhead for Pipestem Creek. 200 – Trail 14 on east heads downhill toward AD Bar Ranch. 202 – At Hogtrail Saddle Trail #32 connects to Rose Peak. 206 – Rose Peak parking area east side. 209 – Robinson Mesa Trail, west side. 212 – Large parking lot and toilets at Sheep Saddle on the west side for #16 Hot Air Trail, which descends to East Eagle Creek. 214 – US 191 ascends to Strayhorse Mesa, a large, beautifully-wooded flat-topped ridge with many side roads that could provide access to primitive camping. 215 – Parking area for Hagen Trail #31. 218 – Lengthy Canyon trailhead on the east and FR 587 on the west. 220 – Strayhorse Campground a few sites very small with lean-to shelters and picnic tables and Toilets. Several hiking trails converge here. From this point, US 191 begins climbing steeply along the scalloped edge of a large mesa. 225 – Blue Vista is definitely worth a stop. At 9210 feet in elevation, there are dizzying views to the south, west and east, as well as restrooms and picnic tables on the edge of the ridge. Several trails converge nearby. Large burn areas from the Wallow Fire of 2011 are more visible here, but the forest is still lovely. 226 – A side road on the east side descends to KP Cienega Campground, a lovely and lightly-used camping area with four sites on the edge of a dry lakebed. On the west side is FR 25, an excellent gravel road that must be one of the major routes in this part of the state, heading west all the way to the Black River and beyond. 231 – Hannagan Meadow Lodge, Hannagan Meadow Campground and trailheads for Steeple Creek and Foot Creek. Aker Lake at 8600 feet. 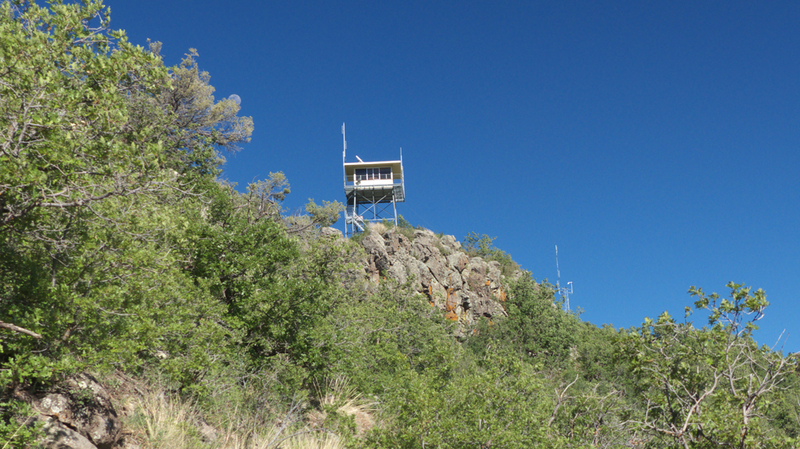 Near milepost 300, about 40 miles past Clifton, pull into the parking lot at Rose Peak, where a half-mile hike leads to a lookout tower at 8700 feet of elevation that provides a breathtaking views of the Mogollon Rim. Your next stop if Blue Vista Scenic Overlook, at 35 miles, with incredible vistas of the Piñaleno Mountains and the Blue River from 9184 feet in elevation. From the nearby KP Cienega Campground, Forest Trail 70 provides access to the Blue Range Primitive Area. This area was heavily damaged by the Wallow Fire, started by careless campers, which scorched more than 500,000 acres in 2011. But the burn areas are slowly coming back to life, and the aspen and lush grasses are taking root. The Coronado Trail is virtually uninhabited, with very few services between Morenci and Alpine. So pack a lunch or stop for a meal or the night at Hannagan Meadow Lodge. Once in Alpine, stop at the Alpine Ranger Station for information about area hikes. For the perfect weekend excursion, continue east on US 180 from Alpine, crossing into New Mexico and passing through the lake country near Luna. Together these two roads create one of the best road trips anywhere in the Southwest. As you descend from the pine forests to the high desert, you'll skirt the San Francisco River, one of the Southwest's longest rivers. The San Francisco rises in Arizona's White Mountains and flows east into New Mexico, through the remote San Francisco Box Canyon. It continues south along the Arizona and New Mexico border and makes a 90-degree turn back into Arizona, just south of the San Francisco Hot Springs. It is then joined by the Blue River and passes through Clifton on its way to join with the Gila River in the Gila Box Riparian National Conservation Area. There are side trips aplenty which could easily turn this into a much longer trip, including rough-and-ready Reserve, New Mexico, where you'll find gas, groceries and a smattering of restaurants. The Alma Grill in Alma, New Mexico, is a favorite stop for breakfast, lunch and provisions. 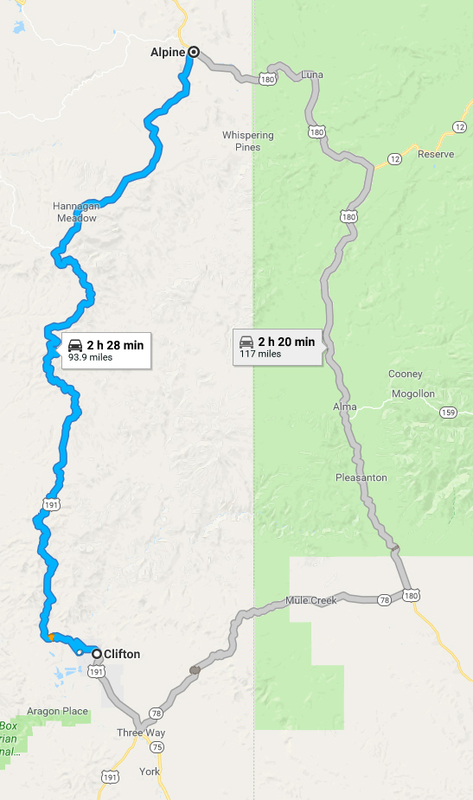 And if you happen to be in the area on a summer weekend, don't miss the chance to follow a truly terrifying one-lane mountain road to the ghost town of Mogollon. South of Glenwood, look for State Route 78, which will take you up and over spectacular Mule Creek Pass and back to Clifton.